You are not alone. Our team of personal injury lawyers at McLeish Orlando will ensure the best possible result for your case, and shelter you and your family from the stress of dealing with insurance companies. Get a Free Consultation to find out if you have a claim for your critical injury. Most of our referrals come from other lawyers. They know we have the expertise and reputation to take care of their clients. We even get referrals from insurance defense lawyers who have opposed us on other personal injury cases – they’ve seen firsthand what our team can do, and recommend us because they know nobody does a better job of getting a fair settlement or in presenting a case the courtroom. We’ve achieved some of the largest personal injury settlements in Canadian history. McLeish Orlando has recovered the largest personal injury damages award in Canada – an $18.4 million award for a young brain injured girl and her family against a negligent driver, an insurance company and the Ministry of Transportation. My experience working with John McLeish, far exceeded my expectations. McLeish Orlando’s knowledge, skill and attention to detail made the process of my lawsuit far much less traumatic than I expected. The injury I suffered was life changing. During a very vulnerable and stressful time in my life, John’s team of incredibly dedicated staff connected me with the best doctors and health care professionals. The encouragement, the explanation of what was going on at all times, and the continuous communication was very comforting to me. The final settlement was significantly more than I expected. It gave me a fresh start and allowed me to live my life. Most Recommended Lawyers by Lexpert, Recognized by Best Lawyers. 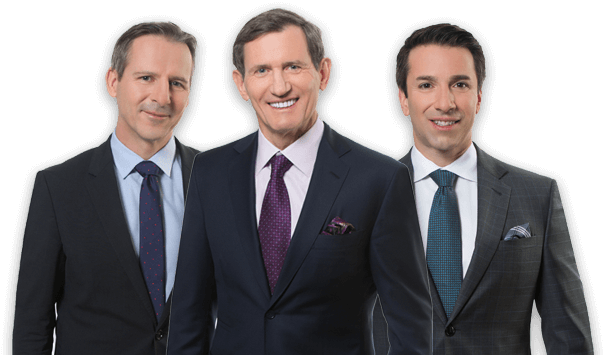 Each year since 2014, principal partners John McLeish, Dale Orlando, and Patrick Brown have been ranked Most Recommended by Lexpert, a leading peer-ranked legal rankings publication. Each of the principal partners have also been listed in “Best Lawyers” every year since 2014. In 2016, partners Salvatore Shaw, Rikin Morzaria were also selected to be listed in Best Lawyers. Many lawyers in Ontario and throughout Canada have found it more practical to refer their clients to us. There are many reasons why lawyers refer their personal injury clients to McLeish Orlando, but peace of mind is at the top of the list. Our firm only handles personal injury cases. Unlike other law firms, we won’t simply “settle out” your client’s claim. We have “in-house” personal injury lawyers and a professional staff prepared and determined to go the distance on each and every case until a fair and full resolution is achieved. Brain injury including mild traumatic brain injury, moderate to severe TBI, hypoxic brain injury and injuries affecting the frontal and temporal lobes of the brain. Serious orthopaedic injuries including complex fractures, compound fractures, comminuted fractures, that extend into joints and injuries to ligaments, tendons and other connective tissues. Spinal cord injury including complete and incomplete SCI and the paralysis, chronic pain and fatigue that accompany these injuries. Wrongful death caused by the negligence of others. Injuries to children including swimming pool injuries, injuries from defective products or equipment, school trip injuries and improper supervision injuries. McLeish Orlando has a long and proven track record of success representing clients who have suffered from personal injuries. cases like those on the left.